Taking your dog to the beach requires a little bit of planning. To begin with, dogs should not be taken onto beaches that explicitly prohibit them. Next, if dogs are to be taken to the beach during the day then they need to be watched carefully for their own and everyone else’s safety. If owners will not be able to keep an eye on their dogs then they should be left at home. Some beaches prohibit dogs, some beaches allow dogs on leads and some beaches are totally open to dogs. In order to find out about potential restrictions at your beach of choice, check in with your local authority. If you are travelling then be sure to ask at your accommodation site or with the local authority in your new area. Taking a quick trip to the beach prior to going for the full day may also alert you to whether or not dogs are allowed as beach rules are usually signposted. Though dog owners may not agree with beach rules, they should remember that these rules are in place for a reason. For example, dogs may be prohibited at certain times because the beaches are too crowded or because marine life may be endangered. 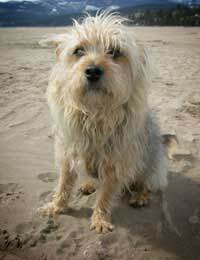 Dogs may be required to be on leads for the safety of beach animals such as birds or turtles or so that they do not scare other beach-goers. Dogs may be welcomed without restriction during certain hours, days or even months when there are less people around. When you take your dog to the beach for the day you need to watch out for your pet’s health and safety as you would the health and safety of any other member of your family. Bring fresh water for your dog and allow him or her to rest in the shade as needed. Don’t allow your dog to stand for too long in a hot car park, to wait in a hot car or to sit or stand on hot pavement as dogs’ feet can burn this way. Also try not to let your dog drink too much saltwater or diarrhoea or even vomiting could result. Try not to let dogs swim for too long and always ask if jellyfish are in the area as these animals sometimes target dogs. If you allow your dog to run on the beach, try to have him or her “cool down” with a good walk afterwards as they may have used muscles that they are unaccustomed to working. Try to keep dogs away from beach debris such as broken glass, fish hooks or sharp shells, and give your dog a good inspection and fresh-water rinse at the end of the day. Also remember to feed your dog if you are away for a whole day, which might seem obvious but sometimes gets lost in the shuffle if dogs seem to be particularly busy and enjoying themselves. Enjoying a day at the beach with your dog will provide your family with many memories, but it also requires a bit of planning and a lot of careful observation to make sure that your dog stays as safe and healthy as possible. If you have any particular questions specific to your dog, be sure to ask your veterinarian about what will need to be done to help your pet enjoy at a day at the beach.